Soon after her commissioning on May 23, 1943, USS New Jersey’sfledgling newsletter was first published with the name of “Clean Sweep Down”, but that soon changed. 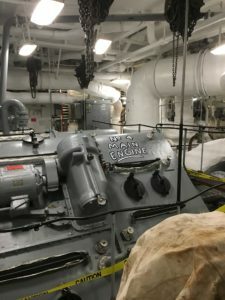 A naming contest for the ship’s paper was held among the crew, and in November 1943, PFC Carl W. Ritner, USMC, a member of the Marine Detachment, won the contest (“and 10 bucks,”) by submitting“The Jerseyman.” It is still being used today. 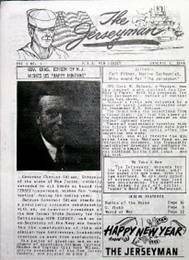 The first issue of The Jerseyman, seen here in the photo at right, was dated January 1, 1944. Along with a “Happy Hunting” message to all hands from Governor Charles Edison, Governor of the state of New Jersey, it also introduced itself with: “We Take A Bow” – The Jerseyman appears for the first time this week, sailing under its new name, with its new masthead. We are very proud of ourselves, and of our fine new appearance. The masthead was drawn by our art editor, Gunner’s Mate 3/c J.W. McFarland.” The first issue was 12 pages long, and contained news items and input from the ship’s divisions, and of course, cartoons. But today’s “modern” Jerseyman, is a bit different than what was distributed to the crews during WW2, Korea, Vietnam and during the 1980’s. Using today’s advanced computer technology, it was launched again in January of 2002, but designed primarily as a “keepsake Journal” that first celebrates the proud history of USS New Jersey and honors all of her former crews, but also honors the many hundreds of volunteers that have helped to restore her as the Battleship New Jersey Museum and Memorial that she is today. 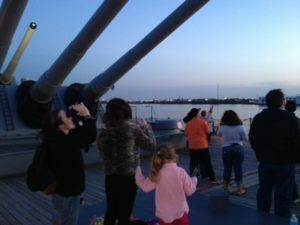 And because the Battleship New Jersey volunteers represent hundreds of navy ships and units, most of which are now long gone, The Jerseyman has also tried to link our volunteers back to their old ships through photos of US Navy and US Coast Guard ship’s bells. We hope that readers will return often to scan through past issues of The Jerseyman, and to look for new issues on the ship’s website each quarter. Plus, there are Jerseyman plans to add historic photographs from each of the ship’s four commissioning periods, and we are also working on a slideshow of the ship’s restoration with hundreds of “Before and After” photos taken by volunteers. As the Keynote speaker during Battleship New Jersey’s 60th birthday celebration held on May 23, 2003, Captain Robert C Peniston, USN (Retired), remarked that because of the hard work of her volunteers, the ship appears “ready for sea.” Captain Peniston also has his stirring December 17, 1969 decommissioning words of “Rest well, yet sleep lightly and hear the call, if again sounded, to provide firepower for freedom…” forever present on the cover of each issue of The Jerseyman of today. 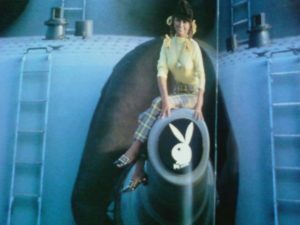 As seen here at the left, his phrase was also permanently painted on the water tank inside of a 16” turret by a 1980’s crew. 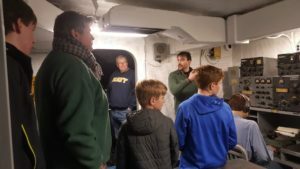 The Jerseyman is an independent online magazine, and produced as a keepsake journal for Battleship New Jersey museum volunteers, the former crewmen of USSNew Jersey, and for our readers. The Jerseyman is not sold, subscriptions are not offered, and all credited photos, cartoons and stories are the sole property of their authors. Wherever possible, The Jerseyman requests permission, properly credits, and identifies the source of photographs, stories, or quotations. If crediting errors, or any possible copyright infringements are found, please let us know and corrections will be made.